All the garden arches that we supply are easy to assemble. They come flat-packed, with all the screws and fittings that you will need for home erection. Omega Top Arch with Seat 60cm depth x 125cm width x 225cm height. Fully Tanalised for extended life. Garden rose arch with seat. 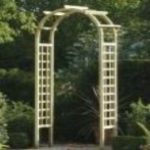 Rose Arch 70cm depth x 100cm width x 260cm height Our basic timber garden rose arch. Garden arches provide a brilliant way to add character and height to your garden. Available in a variety of different widths and heights, garden arches can help create a feature or an architectural focal point. The garden arches available from Oakdale Fencing come in a variety of different styles. We stock both bow top and omega top garden arches. All of the garden arches available at Oakdale Fencing are built to the highest standard. Our garden arches are made from quality tanalised wood ensuring your new garden feature will last for decades. The the pressure treated tantalised wood helps prevent the structure from harsh weather and rot, whilst still maintaining its natural beauty. Sturdy and durable, wooden garden arches look very natural in a garden or park setting. Compared with their cheap metal or plastic counter parts, wooden garden arches provide a natural charm and blend in well with most gardens. Many people choose to keep the natural look of the wooden arches, however the wooden structure can be painted to suit its surroundings or a preferred colour. Climber plants can be incorporated with in the garden arches, with gardeners often choosing to plant entwining honeysuckle or ivy at the foot of the structure for it to grow around the garden arch. Oakdale Fencing stock 2 main types of garden arches. Single standard garden arches (these are great as a feature, to grow plants around, or as an arch above a path within your garden) and garden arches with a seat. Garden arches with a seat have a bench connected from one side to the other. This provides a lovely sitting area underneath the arch where you can look out onto the rest of your garden. There are many uses for garden arches. They can be incorporated within a garden to provide a seating area of place from which you can look out over your garden. Placing your arch at the back of your garden will create a focus away from your house or property and draw attention to a certain area. As well as creating beauty and a natural look and feel, garden arches can be used as dividers between property or to distinguish borders without having to erect a fence. Arches with seating are often placed within close proximity to ponds, water features or areas of beauty. This provides a great place to sit and admire a view from. All the garden arches from Oakdale Fencing are easy and simple to construct. Simply ensure that your post are straight and fix them into the ground, attach the trellis to the posts, and finally attach the arch to the top of the posts. If you would like any help or have any questions regarding building your garden arch, please feel free to contact Oakdale Fencing.